Want to know just how much streaming is ushering the good times back to major music companies? Get a load of this. 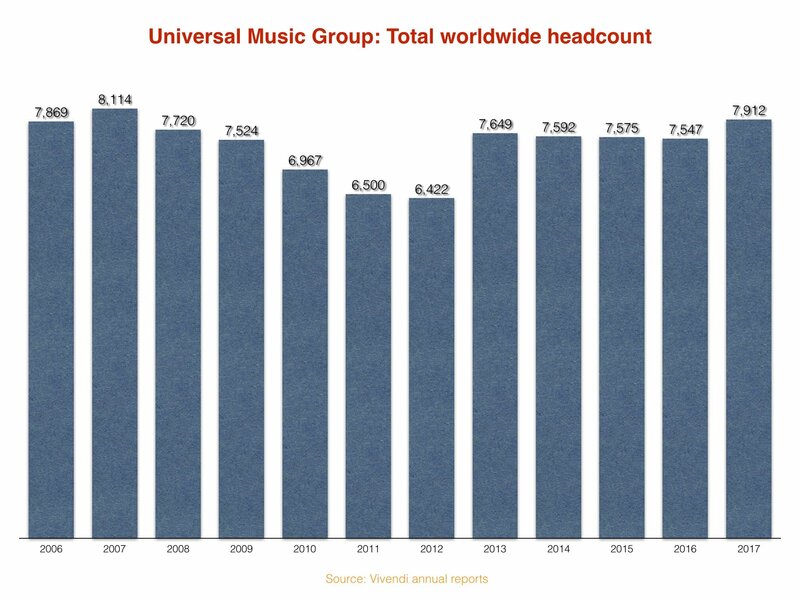 Universal Music Group ended 2017 with a global staff headcount of 7,912 people – up by 4.8% year-on-year. 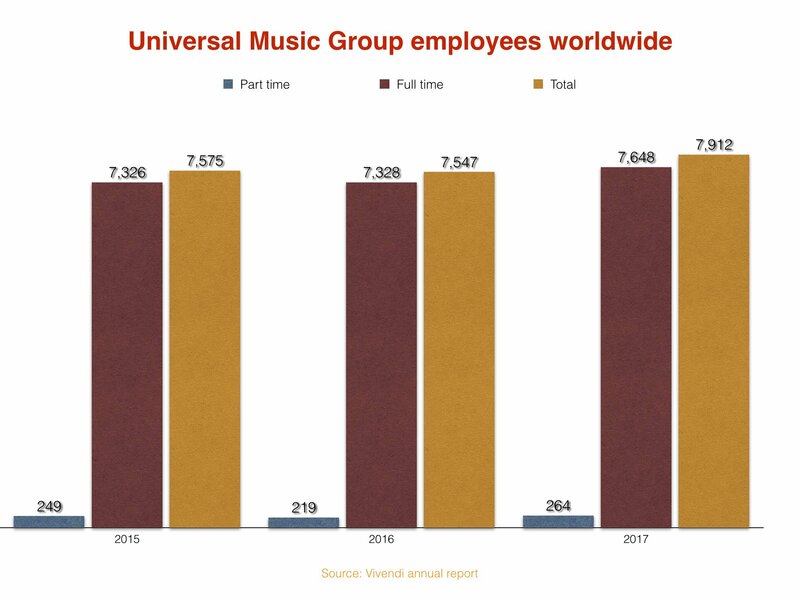 According to data published by Vivendi and analyzed by MBW, that was Universal’s largest year-end headcount since way back in 2007 when the firm employed 8,114 people worldwide. Here’s one take on these figures: UMG turned over €4.87bn in 2007, while last year its revenues stood at a record €5.67bn. That means that the average employee at UMG last year was worth around €717,000 to the company in revenues across the 12 months. Back in 2007, this figure was down at €600,000. Some 264 of UMG employees were in part-time roles in 2007, with the remaining 7,648 in full-time positions. For those who like a bit of scandal and intrigue with their employment data – and goodness knows, who doesn’t? – Universal fired 147 people last year. 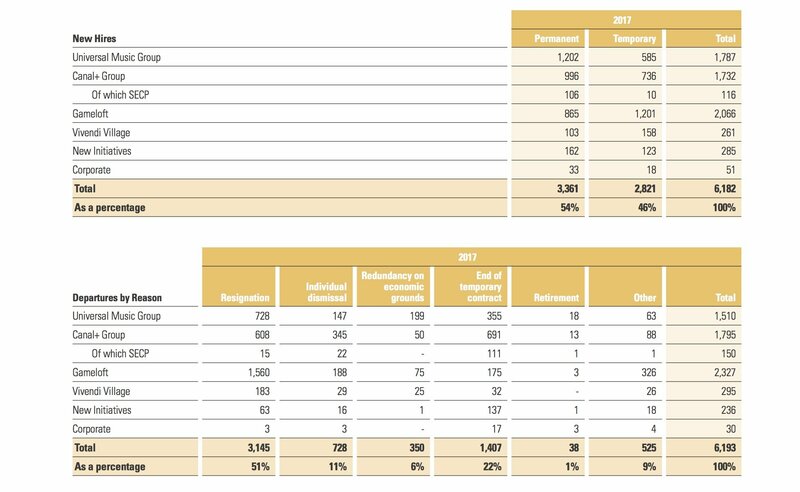 In total 1,510 employees left the company in 2017 across a variety of resignations (728), ‘individual dismissals’ (147), redundancy (199), contracts coming to an end (355), retirement (18) and for other unnamed reasons (63). Across the same period, however, UMG hired 1,787 new staffers, including 1,202 permanent contracts and 585 part-timers. With a furore over the UK gender pay gap still on the industry’s mind, it’s interesting to note that – according to Vivendi’s figures – UMG’s global workforce was pretty balanced in 2017. 48% of employees at the company last year were women (3,793), with 52% men (4,119). That was an improvement on the two previous years, when 47% of UMG’s employees have been female. Interestingly, Vivendi says that, of the 4,697 employees in managerial positions employed by UMG at the end of last year, 2,000 – or 43% – were women. Top global UMG execs today include: Michele Anthony, Executive Vice President and Member of the Executive Management Board; Jody Gerson, Chairman and CEO of Universal Music Publishing Group and Member of the Executive Management Board; Wendy Goldstein, Republic Records Executive Vice President and Head of Urban A&R; Ethiopia Habtemariam, Motown Records President and Head of Urban Music at Universal Music Publishing Group; and Michelle Jubelirer, Capitol Music Group Chief Operating Officer.